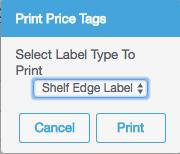 Users now have the option to print shelf edge labels for their products that contain a scannable barcode and price. 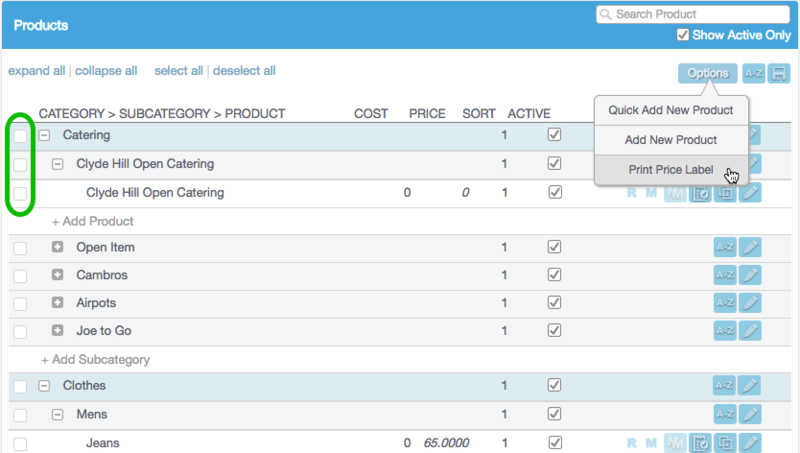 On the Products page of the Management Console, the "Print Price Label" option is now selectable from the "Options" drop down menu. Use the check-boxes next to categories, subcategories, or products to select the products for which you wish to print shelf labels. The image below highlights those check boxes and shows the new "Print Price Label" option. After selecting the desired products, click the "Print Price Label" option will bring up the "Print Price Tags" confirmation window. Clicking on Print will download a PDF of the desired labels, which can then be print from the computer. Example labels are shown in the image below. Standard shelf edge label size is 57x38mm. Please Note: These labels are printed from your own personal printer connected to your computer. The .pdf may require you to edit the print settings according to best practices per your personal printer. These do not print on Zebra or Dymo printers.